Most grandparents would struggle to understand what twerking is, let alone bust a raunchy move themselves. But these four dancers have proved themselves way ahead of the curve by filming their own video dancing to hits including Low by Flo Rider and Psy's mega-hit Gangnam Style. 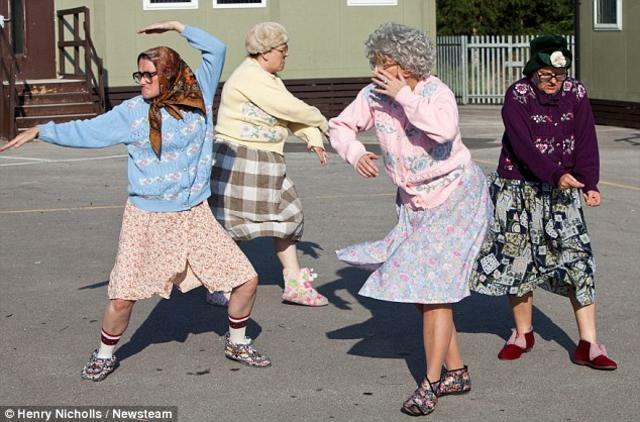 The troupe were filmed springing into action despite their greying hair, floral skirts and sensible cardigans. Footage from their performances around Stourbridge in the West Midlands has brought them hundreds of thousands of hits after being posted online, bringing unexpected fame to the dancers. However, those who find the routines cranked out by these 'grandmothers' implausible for their apparent age may not be surprised to learn that in this case looks can be deceiving. 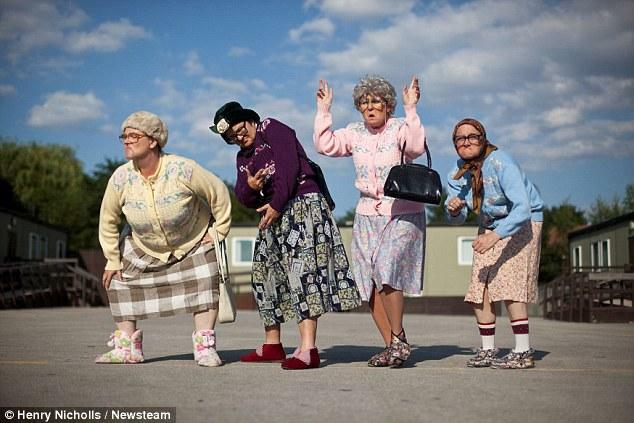 The 'grandmothers' - in fact aged between 33 and 51 - are a practiced group who perform for a local theatre company. 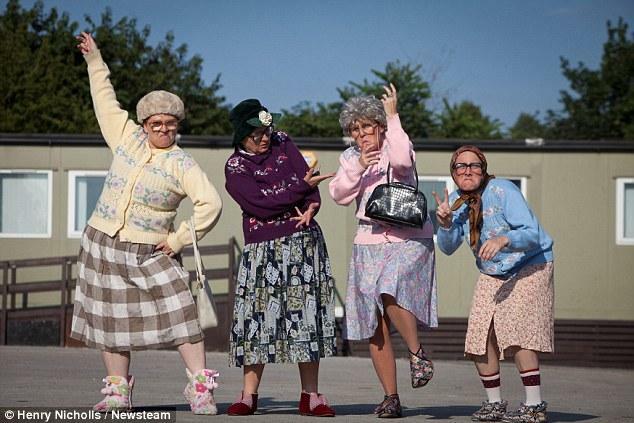 Sue Hawkins, 42, Jackie Fellows, 51, Deb Nicholls, 42, and Emma Rollason, 33, perform together for Fizzog Productions, a theatre company based in Dudley, West Mids. 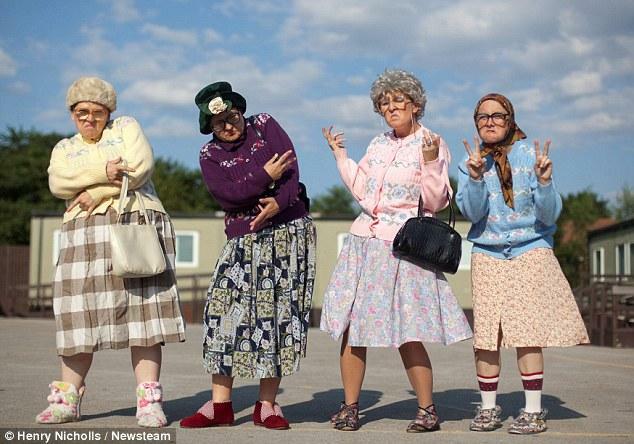 They have had viewers in stitches by defying their apparent age busting some moves to the popular music hits. Since being posted online the clip has been so popular the dancers have now been invited to the USA to appear on TV shows. The hysterical video was taken by Lucy Rutherford who posted it on YouTube and Facebook later that day. By the following morning, she said she was getting emails, notifications and friend requests from people across the world. The video has quickly become an online sensation and has already received 965,000 views and shares online in less than a month. Today Ms. Rutherford, a paramedic, said: 'I just put it up to show friends and family really. Then, I was getting notifications left, right and centre from people across the world. 'I didn't ever think it was going to be this popular. From the morning after, it just spiralled out of control. 'I have had friend requests online from people everywhere, like Australia and Japan this week. It is unbelievable. The professional dance group have been together for 14 years after meeting at college where they studied Community Theatre. Sue Hawkins, a company director, who plays the elderly character Letty in the wacky dance act said: 'We just cannot believe the reaction we've had to the video. 'We have had a huge response from people in India who loved the Bhangra dancing and from people in Japan who enjoyed our version of Gangnam. Ms. Fellows plays the elderly character May, Ms. Nicholls is Hilda, while Ms. Rollason portrays an OAP called Ruby. Ms. Hawkins added: 'These characters have been around for some time and they appear in comedy sketches which we perform at community events and shows.